Recently I got a great deal on some large & juicy blueberries at our local fruit orchard and couldn't resist buying them. Yup, if it's a great deal...I have a hard time walking away. Anyway, I bought 5 lbs. of organic, fresh blueberries and decided to make some homemade blueberry jam. The recipe that I used is from the Ball Blue Book - Guide to Preserving. This recipe uses no pectin. The recipe will make 6 half-pint or 3 pint jars of jam. Here's the recipe. Prep: Wash berries under cold running water and then drain. I like to let mine sit in the colander for about 5 minutes to make sure all of the water drains away. Coarsely crush blueberries one layer at a time using a potato masher. You will need 9 cups of crushed berries to make this recipe. Cook: Combine the crushed berries and granulated sugar in a large saucepan (I use a medium-sized stock pot). Bring the mixture to a slow boil, stirring until the sugar dissolves. Increase the heat to medium-high and cook rapidly to gelling point of 220 degrees F, stirring to prevent sticking. Please note, your mixture might "splat" and it will be hot so I always wear oven mitts while stirring it to prevent those "splats" from burning my hands. Remove from heat and skin off any foam that may have formed. Fill: Ladle hot jam into hot jar, leaving a 1/4" headspace. Remove air bubbles and wipe the jar rim clean. Place the seal and band onto the jar, adjusting until it's fingertip tight. Place jar on the rack elevated over simmering water in your water bath canner. Repeat until all of your jars are filled. Process: Lower the rack into the simmering water. The water needs to cover the jars by at least 1" in depth. Adjust heat to medium-high, cover the canner and bring the water to a full rolling boil. Process half-pint or pint jars for 15 minutes. Turn off the heat, remove cover and let the jars cool for 5 minutes while sitting down in the water. Remove jars from the canner. Lay a towel out on your counter and place the jars on top. Let them cool for 12 hours. Check to make sure all jars are sealed before putting them into your pantry for storage. Any jars that didn't seal will need to be refrigerated and used right away. 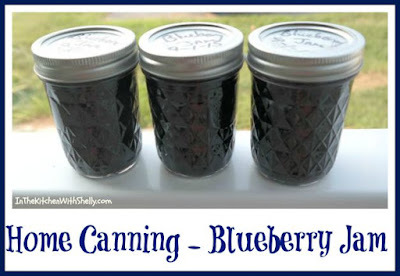 I love the idea of making my own blueberry jam. you are continuing to give us so many great canning recipes.